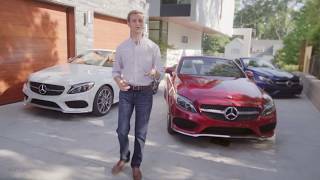 The C-Class from the house of Mercedes always rolled the dices in favor of buyers and the brand. It has been a tough competitor for BMW and Audi; however at the 2016 Geneva Motor show they unveiled the Mercedes-Benz C-Class Cabriolet 2017. The convertible model takes the lineup a lap ahead and offers its buyers some incredible features and upgrades. 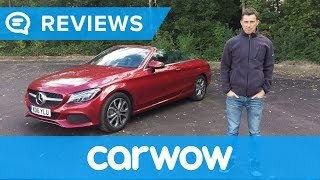 Let us have a look at the review of Mercedes-Benz C-Class Cabriolet 2017 to know in detail about it. The interior of Mercedes-Benz C-Class Cabriolet 2017 resembles to the sedan sibling of the model. Everything starting from the information display for driver till the seat adjustment buttons on the door are a carried forward from the sibling. However certain changes are integrated that were necessary for the cabriolet. In lieu to this the model gets inclusions like, AirScarf neck heater, integrated into the head rests. There is one interesting feature, it is for the driver. The feature will on its own start pumping the hot air (connected to climate control system) through vents towards the driver’s hand. There is an option of Premium Package that includes AirCap automatic draft top system and an option to upholster seats with heat-reflecting leather. The latter comes with five color options. 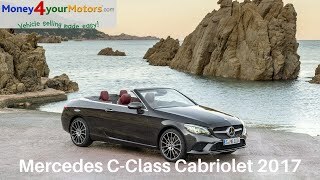 Thus rounding up the interior details of Mercedes-Benz C-Class Cabriolet 2017 I would call it as an impeccable amalgamation of features that avail comfort, luxury and better driving experience. The exterior of Mercedes-Benz C-Class Cabriolet 2017 carries some hints from its S-Class sibling. Starting with the front fascia we have a diamond radiator grille, sitting amidst the set of LED headlights. The windshield gets the chrome trim surrounds while the lowered beltline further adds to the sportier appearance of the model. Moving towards the rear end you’ll notice the 18-inch wheels fitted well under the beefy arches. The retractable roof is made from the fabric. Basically company used multi-layer material allowing the roof to retract in less than 20 seconds and can be done at up to 31 mph. At the rear end we have the LED taillights, slim and elongated making their way till the sides. You can notice numerous lines marching through the sides till the rear, adding to the sportier appearance. Thus rounding up the exterior details of Mercedes-Benz C-Class Cabriolet 2017 I would call it luxurious and sportier. The Mercedes-Benz C-Class Cabriolet 2017 will come in eight drivetrain options. Let us start with the C 220 d (4Matic) and C 250 d which gets their power through a 2.2 liter four-cylinder engine cranking total output of 170 hp and 204 hp and peak torque of 400 nm and 500 nm respectively. Further we have C180 getting juice from a 1.6 liter four-cylinder engine producing total output of 156 hp and peak torque of 250 nm. Further we have a 2.0 liter four-cylinder engine powering C 200 (4Matic), C250 and C300 with the total output of 184 hp, 211 hp and 245 hp and peak torque of 300 nm, 350 nm and 370 nm respectively. Last in our list of options are C400 4Matic and C43 4Matic that get 3.0 liter V6 engines that produce total output of 333 hp and 367 hp and peak torque of 480 nm and 520 nm respectively. The above listed models can sprint from 0-62 mph in 8.3 sec, 7.2 sec, 8.9 sec, 8.2 sec, 6.9 sec, 6.4 sec, 5.2 sec and 4.8 sec respectively. 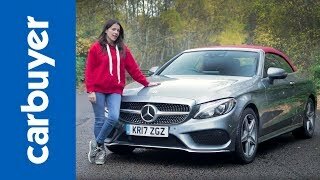 While the top speed of Mercedes-Benz C-Class Cabriolet 2017 range touches the mark of 143 mph, 151 mph, 138 mph, 146 mph, 152 mph, 155 mph, 155 mph, and 155 mph respectively.